Welcome to video four in the How to Play Guitar series. In this lesson, I’m going to teach you how to strum on your guitar and help you get your strumming hand up to speed. Soon you’ll be able to strum the chords you learned in the last lesson, and start making some real music. We’ll start this lesson off by going through some tips on technique for strumming. Technique can be subjective, so you’ll get to experiment with the tips I give you and see what works for you. From there, we’ll go over the constant strumming technique which will help you play a lot of different strumming patterns in your favourite songs. To finish the lesson, I’ll teach you some essential strumming patterns that you need to know as a newer guitar player. Starting with strumming techniques, the first tip I want to give you is to relax. If you’re tensing up while you strum, it could lead to potential injuries and it will make your paying sound stiff. If you start to feel any tension in your arms, shoulders, or any other areas when you’re playing, just stop for a moment and start over. The second tip I have for you is not to lock your wrist, and not to strum from just your elbow. You want to have a nice fluid motion in your arm instead; almost like you have something stuck to your hand and you’re trying to flick it off. You’ll notice in the video that my wrist is moving and my elbow is helping too, both moving fluidly together. Next I want to talk about ways to grip your pick, which is very subjective since it’s different for everyone. Hold your pick in front of you, put your thumb on it, and come down on the pick with your index finger as naturally as you can. As you grip the pick, your fingers might curve in, point straight out, or something different depending on what is comfortable for you. When I’m strumming a lot, sometimes I’ll grip the pick with two fingers to prevent the pick from flying out of my hands. This gives me a little more control and allows me to stay relaxed, so you may want to try that. The next technique I want to look at is the angle of the pick that you strum with. Some people will have the pick angled upwards as they strum, while other people will keep the pick parallel with the strings or even pointed downwards a bit. The angle of the pick doesn’t really matter here. Experiment with your pick grip using these different techniques, and it will be up to you to decide what is the most comfortable. For those of you who don’t use or don’t want to use a pick, that’s okay. Using your fingers, pretend that you’re holding a pick, and then strum with your index finger and your thumb. Now we’ll look at the constant strumming technique, which will help you figure out the strumming patterns in a lot of your favourite songs later on. The constant strumming technique means you always keep your arm moving up and down when you’re strumming, even if you’re not actually hitting the strings on every beat. Let’s get into our first strumming pattern so you can see what I mean by constant strumming. It’s a simple pattern with only downstrokes, and it demonstrates the constant strumming technique really well. I’m going to play along with a metronome, so you’ll hear the quarter note beats in the background. We’re going to play in 4/4 time, so each measure will have four counts, which is our quarter note pulse. I’m going to keep it simple by playing a G chord, and our first pattern is using all downstrokes on the quarter notes. You can watch me play a sample in the video, and you can see that every time I made a downstroke, my hand had to come back up without hitting the strings. That’s what the constant strumming technique is, always keeping the down-up rhythm going with the beat. I’m only actually strumming the strings on the downstrokes for this strumming pattern though. Remember to stay relaxed, avoid locking your wrist, and work on your pick technique as you try this strumming pattern. At the bottom of the screen in the video, you’ll see the counting for the pattern, and above each number, you’ll see a symbol that represents a downstroke. When I play this sample in the video, I’m playing to a metronome set at 70 beats per minute. If you need a metronome track, you can download the track that comes with this lesson to practice with. Our next strumming pattern will introduce you to upstrokes. This pattern is still regular quarter notes, but we’re going to alternate downstrokes and upstrokes. When new guitar players start using upstrokes, a couple of problem areas can come up. The first problem is they feel like they can’t get the pick up through all the strings or the pick will come flying out of their hands because they don’t have enough control. A big tip I have for your upstrokes is to strum with the tip of the pick, just enough to make the strings sound. If you dig in to the strings with too much of the pick, the pick will probably fly out of your hand, and it will be harder to get through the strings. The other tip for good upstrokes is that you really only need to hit three to five of the top strings. Don’t feel like you need to hit all six strings with your upstrokes. Try practicing some upstrokes by themselves first, remembering not to dig in too much with the pick. This strumming pattern is going to alternate down-up-down-up on the quarter note beats, over and over again. Check out the video to see me play a sample of this pattern. The next strumming pattern we’ll learn is very similar to the last one, where we alternate downstrokes and upstrokes. We’re going to raise the stakes a little, and use eighth notes instead of quarter notes. This means we’ll have twice as many strums, using downstrokes on the numbers and upstrokes on the ands. In the video, you can see the strumming pattern on the bottom of the screen as I play an example of this pattern. If this pattern is going too fast for you, you can download a different metronome track that is slower than 70 beats per minute. You can use whatever you need to get this strumming pattern down. 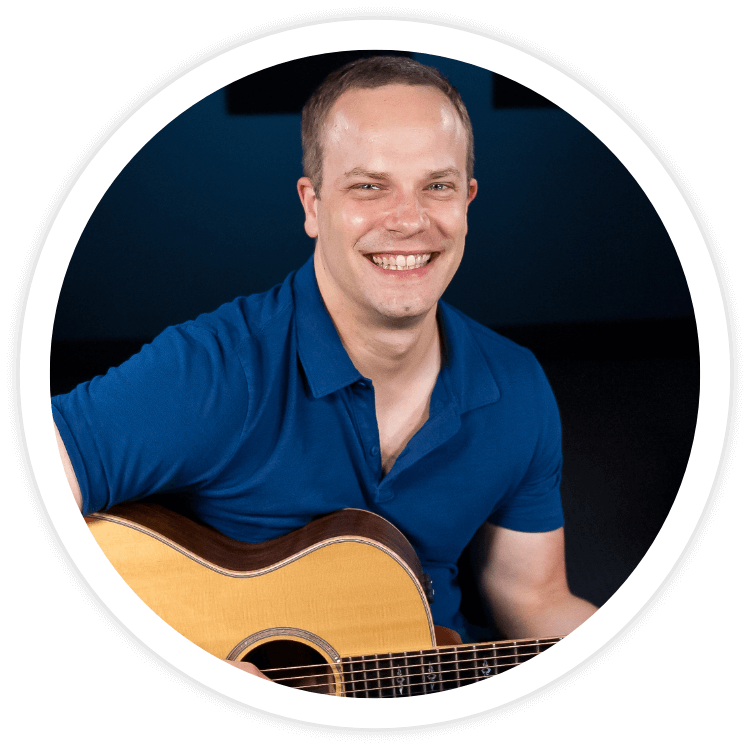 The last strumming pattern we’ll learn is the same strumming pattern that we’ll use for the song you’ll play in the next lesson. This pattern is also in eighth notes, but makes use of the constant strumming technique since we won’t be digging into the strings on every count. Check out the video to see this strumming pattern written out on-screen as I explain it to you. It may seem complicated to you, but think of leaving a few strums out of the constant strumming pattern. Try this strumming pattern out very slowly at first, and eventually you’ll get the rhythm down and it will feel natural. In the video, you can see me play this strumming pattern slowly at first, and then also in a more realistic tempo. This is a lot of information in one lesson so don’t feel like you have to get all of this down today. First, remember the techniques and tips I shared with you like staying relaxed, not locking your wrist, and working on your pick grip. Go through each of these strumming patterns one by one, and then spend extra time on the last one since you’ll be using it in the next lesson to play your first song. Thanks for watching this lesson. In the next lesson, we’ll put everything you’ve learned so far together. We’ll take the first four chords you learned and pair it with a strumming pattern so you can learn how to play a song on guitar.